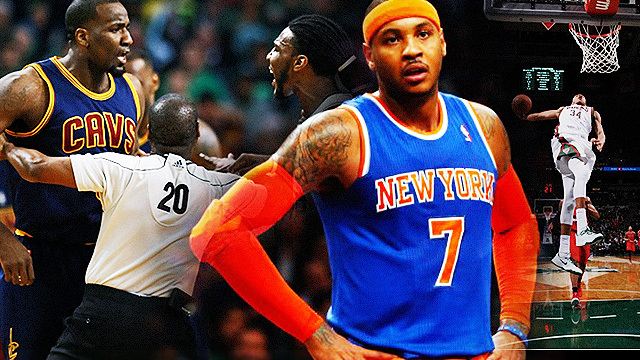 FHM Presents: The 2015 NBA FAIL Awards! Because ROYs and MVPs are so mainstream! The NBA has just announced its All-NBA First, Second, and Third teams, days after the initial individual awards were handed out. While some of us aren't too happy with the results, particularly those who felt their idols were left out; we all can still agree that the chosen players deserved their spots. In this time of hoops award-giving, we decided to come up with our own set of unconventional accolades which we hope the league will consider next season. If expectations weren't high enough for the New York Knicks' franchise player, his fresh five-year, $124 million deal to stay with his hometown team certainly didn't help. Primed for a breakout year, Melo was just able to play the first half of the season after undergoing a knee surgery right after the All-Star Game, in which he was selected as a starter. The Melo Man being shut down then saw the start of the Knicks' (and team president Phil Jackson's) demolition and tanking job. Excuse us with the long title, but the Greek Freak has a far longer wingspan (and surname) and an even longer list of highlights from last season. Together with an up and coming Milwaukee Bucks team led by Coach Jason Kidd, Giannis can only get better from here. Expect a bevy of otherworldly jams, sick handles, and tenacious D from the Alphabet next year. We just hope the same happens for his brother, Thanasis. After spending his first seven years with the Boston Celtics, Perk had no qualms imposing his will against his former team and its players as seen in the video above. Now a member of the Cleveland Cavaliers (after a solid four-year tenure with the Oklahoma City Thunder), his minutes have dipped to a career-low (to even frequent DNPs), but expect the present incarnation of Bad Boy Rick Mahorn to lay down his hard-nosed work ethic whenever he's called to the court. From being a member of a downright awful Knicks team, JR, along with Iman Shumpert, who came with him in the trade, suddenly found himself in serious playoff contention with the Cavaliers. Playing alongside The King, J-Swish had gone from untying other players' shoelaces to setting the Cavs' franchise record with eight three-pointers in their Eastern Conference Finals Game 1 win over the Atlanta Hawks. Now, that's a good transformation!